Aerojet Rocketdyne was the subject of a detailed short report Tuesday. The stock plunged 11% on the day and then recovered almost completely. We expect further short-term volatility as a result of the short report - which may provide short-term trading opportunities on the long side. We remain at Neutral on a long-term basis given the complete rebound of the stock. DISCLAIMER: This article is not directed at, nor intended to be relied upon by any UK recipients. Any information or analysis in this article is not an offer to sell or buy any securities. Nothing in it is intended to be investment advice and it should not be relied upon to make investment decisions. Cestrian Capital Research Inc or its employees or the author of this article or related persons may have a position in any investments mentioned in this article. Any opinions or probabilities expressed in this report are those of the author as of the article date of publication and are subject to change without notice. Aerojet Rocketdyne (AJRD) stock plunged and rebounded Tuesday following the publication of a highly critical report by the short seller activist fund Spruce Point Capital. The stock closed Monday at $34.03, opened Tuesday at $32.15, tumbled to a low of $30.11/share (-11.6% vs prior day close) within half an hour of the market opening, then staged a gradual recovery through the day to close at $33.54/share – in other words a nothingburger for the day as a whole. The chart below tells the story of the day. Thanks entirely to the short-seller, anyone with their wits about them will have made very good money on the long side during the day. The initial response was clearly oversold and whilst the more-or-less full recovery on the day could not have been predicted, one might have expected say a 3-5% recovery on the day from the initial 11% drop. Confidence on the long side would have led to quick gains. Plenty of short reports are lightweight in nature, highlighting increasing competition, margin pressure, etc. 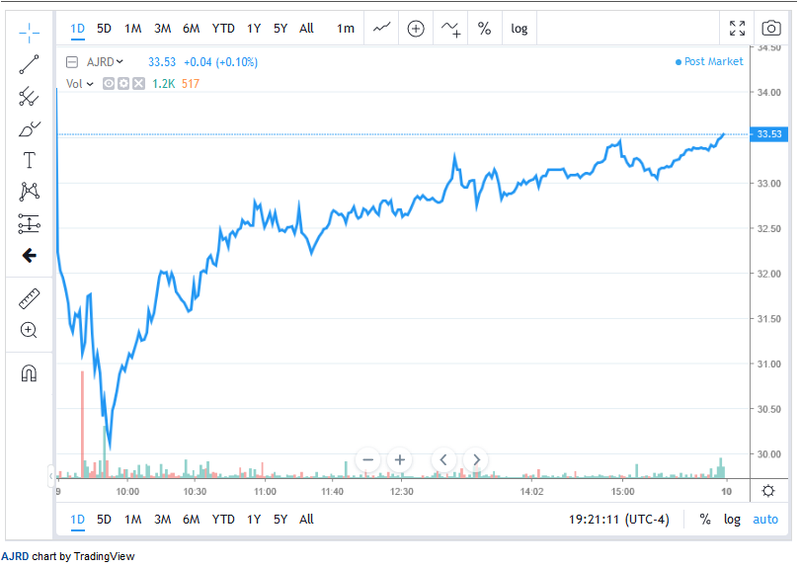 Stocks like iRobot (IRBT) or Tesla (TSLA) have suffered these sorts of reports periodically, with the stock damaged short term only to power on to new highs when the concerns proved overblown and/or purely self-serving for the publisher. Impaired end market growth (their thesis being the erosion of AJRD’s legacy launch sector customer base such as ULA, in the face of the rise of lower-cost vendors such as SpaceX, RocketLab, etc). Accounting issues (claimed overstated earnings and cashflow, and understated liabilities). Board issues (claimed to be of insufficient independence to provide proper oversight). Management incentives (claimed that management have insufficient ownership of the company’s stock to be motivated by share price performance). Current and potential AJRD shareholders ought to read the Spruce Point report. You can find it here. SprucePoint makes a host of substantial allegations. A good deal of work has gone into the analysis and on the surface the report it is sufficient to achieve its aim, which is to depress the stock. The remarkable thing about AJRD’s stock performance Tuesday isn’t the fact of the plunge, it is the depth of fall and then rebound all in the same day. Turning to the Spruce Point report for a moment, there are parts of their note which we ourselves have raised concerns over since we began covering AJRD. The erosion of AJRD’s legacy end market is a fact, as is AJRD’s loss of the main engine slot on the ULA Vulcan. So far, we agree. The accounting, balance sheet, board and management incentive points are SprucePoint allegations and opinion at this point in time. No doubt the company will respond to the allegations – probably not directly at this time, as we assume the company won’t want to flatter the SprucePoint report with a direct point-by-point response – but we would assume that some of SprucePoint’s allegations will be directly or indirectly addressed at quarterly earnings release time over the coming quarters. Regular readers will be aware that our focus is on long-only, equity-only strategies. We think about long-term-hold and short-term-trading ways to profit from the stocks in our universe. We are selective about when we go to a Buy. We think some short-term trading opportunities will follow this short attack on AJRD. The stock is volatile anyway – see our note here detailing a possible trading strategy in the runup to and beyond the Q4 earnings report – a strategy which played out positively on that occasion. The rapid rebound yesterday means we remain at Neutral at the time of writing, but investors should watch closely for oscillation in the stock price. Even if every one of SprucePoint’s allegations are true – which would be surprising – we doubt that will wash through the long-term share price level particularly quickly, certainly not in the next quarter or two. So investors will probably have multiple 5% gain opportunities in very short periods of time. If that sounds trivial, consider that 5% gain in a week means an IRR of over 1,000% and 5% in a month means an IRR of over 75%. We don’t at this time operate a real-time service but we will monitor the AJRD situation closely and post further notes if there is meaningful news. We would suggest that investors watch the price closely, hour by hour in the coming days and weeks, as they may well find compelling short-term long opportunities. As regards long-term hold opportunities we look forward to the company’s Q1 2019 earnings report and we will post a full analysis of those earnings as we did in our Q4 earnings report.